You can’t hear the car (barely visible) approaching on the far left, but we can. Note that the driver of the car to our right isn’t moving, either. Do the math: 100 ft / 1.03 s = 97 ft/s = 66 mph. There’s a reason we don’t start moving instantly when a traffic signal turns green. Elapsed time from green to red: 9.28 seconds. No problem if you’re a car, death if you’re a bike. The white car to our far right started moving into the intersection about the time we did. If you’re going to say we shouldn’t run the light, you gotta deal with cars first, OK? Note the car approaching from the right on the far side of Rt 55. 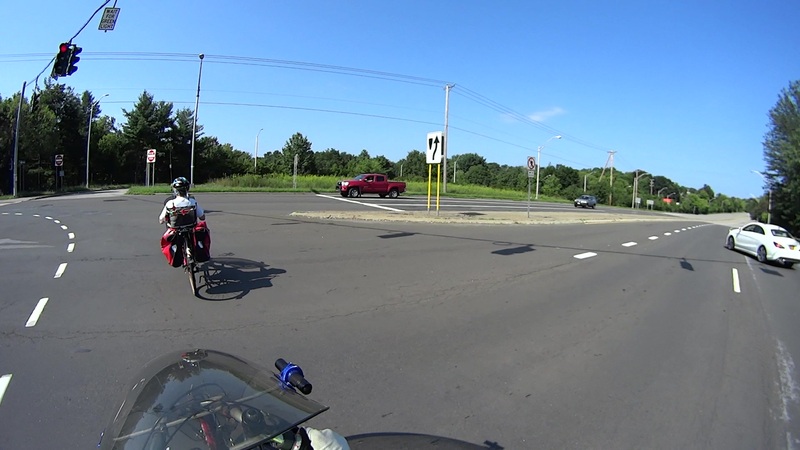 That’s a 40 mph zone, the driver sees a green light, and we’re still in the intersection. If you plunk “burnett signal” into the search box at the upper right, you’ll find plenty of previous incidents along these lines. Despite bringing this hazard to their attention many times (“We appreciate and share your interest in making our highway systems safe and functional for all users.“), NYS DOT obviously doesn’t care. If any of their employees commuted to their office building (which overlooks this very intersection), perhaps they would care, but they don’t: we have yet to see a bicycle in the DOT’s token bike rack. DOT says they’re in favor of Complete Streets, but, seven years on, it’s just another day on the only route between Arlington and the Overocker Trailhead of the Dutchess County Rail Trail. 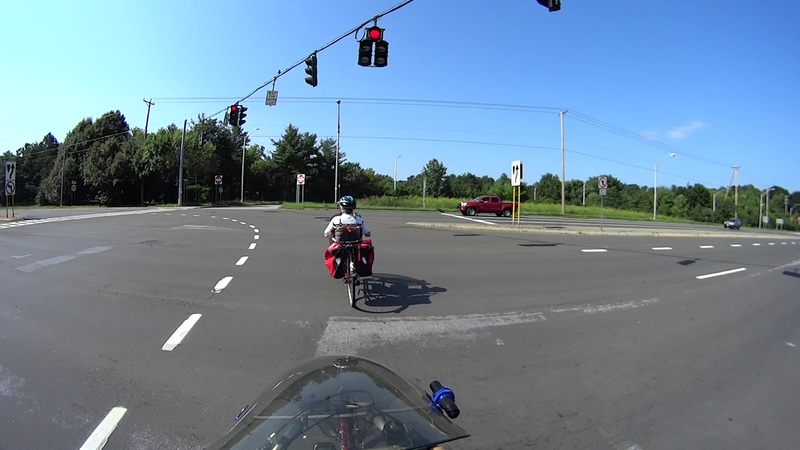 This entry was posted on 2018-08-17, 07:23 and is filed under Photography & Images, Recumbent Bicycling, Science. You can follow any responses to this entry through RSS 2.0. Both comments and pings are currently closed. Any chance of getting the relevant law enforcement to discourage the red-light runners? It wouldn’t fix the timing issue, unless the DOT people got caught a few times. [Evil grin] OTOH, it’s a revenue enhancer for the agency. There’s occasional enforcement action; yesterday, somebody got pulled over on Rt 55 just east of the intersection. Apart from the usual twenty-something males, folks seem reasonably well-behaved and speeding isn’t a big problem. 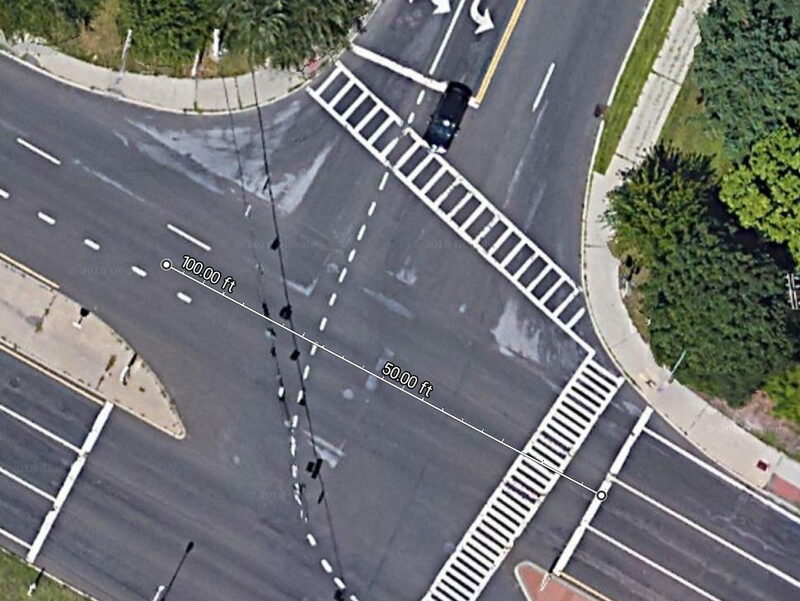 Getting across the intersection before the lights change, now, that’s a problem.